The Historic Jefferson Railway captures the spirit of the Civil War during Pilgrimage Weekend in Jefferson on May 6 and 7 by telling the story of the Great Locomotive Chase. Come ride the authentic 1870’s replica steam train and hear the gripping tale of The Andrews Raid, the Civil War’s most fascinating railroad story. Steam hissing, whistle blowing and pistons chugging, Old Engine #7 known as The Robert E. Lee, will take you on a scenic trip along the Big Cypress Bayou. As you roll through the history laden Piney Woods, you’ll view a Confederate Powder Magazine and traverse the site of one of the oldest, historical towns in Texas. Come see the Living History Camps along the track. During the Civil War, famous campaigns were planned and conducted for the primary purpose of capturing or destroying railroad lines of value to the enemy. On the morning of April 12, 1862, the most famous locomotive of the Civil War, The General, was hijacked by the Union civilian spy, James J. Andrews, and his men. After a nail-biting eight hours and 87 miles, the Southerners captured The General, James Andrews and several of his men. This special event offers a great educational opportunity for school groups on Friday, May 6, with runs at 9:30, 11:30 and 1:30. The public is welcome to attend. Train rides are also available on Saturday, May 7, at 12:30, 2:30 and 5:30. On Friday and Saturday evenings at 8:00, a Civil-War themed Fireside Ghost Stories will take place at the Historic “haunted” Depot. And best of all, it is FREE. Then jump on the Historic Jefferson Railway’s famous Ghost Train at 9:00 p.m. to discover the haunts of the Civil War. The trip takes you deep into the dark and scary Piney Woods of East Texas. Listen to the narrator tell Civil War ghost stories while you keep an eye out for paranormal activity. Historic Jefferson Railway is located at 400 E. Austin, Jefferson, TX. 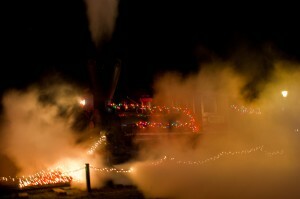 For more information, contact info@JeffersonRailway.com, visit http://jeffersonrailway.com/, or call 866-398-2038. This entry was posted on Friday, April 29th, 2011 at 12:03 pm and is filed under Battle of Port Jefferson, Civil War, Historic Jefferson Railway, The Carriage House Bed and Breakfast. You can follow any responses to this entry through the RSS 2.0 feed. Responses are currently closed, but you can trackback from your own site.